Volunteers Serving The Need (VSTN) was created by founder and CEO, Gigi M E Ramos. Ms. Ramos had witnessed first hand the special needs of Military Veterans and wanted to bring to light the common misconception that “once you are a veteran, the US Government will provide you with any type of assistance you may need.” In reality, Veterans receive federal support only for their service related injuries or illnesses. Once they are home, the Veterans are just like any other group of individuals and sometimes have a hard time making ends meet. As Ms. Ramos states, “It is sad to see what some of these Veterans are going through. Some are young and some are old, but oh, problems they’ve got!” July 2, 2009- VSTN started in a carport with two bags of clothing and a dream. In October of 2009, VSTN was able to apply for and was granted 501 C3 status. Gigi hunted for a more permanent place for the Thrift Shop and for food distribution. 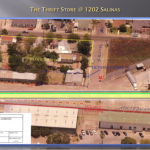 In January of 2010, VSTN opened the doors of The Thrift Store @ 1202 Salinas and was granted permission to purchase food from the South Texas Food Bank. At that time, of the over 8,000 Veterans in Webb County, only 37 of the veterans that had been approached had applied to the assistance program. 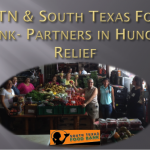 By August 2011, less than 2 years after opening, VSTN was providing food to approximately 500 veterans and their families each month (the numbers will vary from month to month as sometimes the veterans will be traveling out of town for medical reasons.) As time went by, it became clear that there was a need for services beyond food and toiletries. Volunteers Serving The Need stepped up to the plate and started coordinating with other agencies to ensure that Veterans receive whatever help they may need, including assistance in filling out food stamp applications, classes on overcoming debt, finding clothing suitable for job interviews and transportation to/from appointments and interviews. 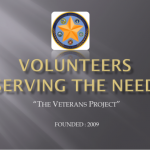 VSTN wishes to create a network of help for the Veterans of Webb County. 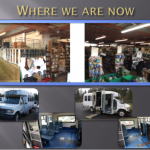 Due to the growth of The Veterans Project, by 2011, VSTN needed more space and received a donation of 3 semi-trailers for expanded Thrift Store storage. The Thrift Store transitioned to more of a Mercado type of market due to the added need for indoor food storage for our growing client list. 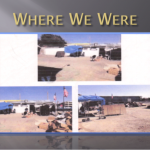 At that time, the primary source of income for VSTN was Thrift Store sales so expanding the store was essential to the survival of the Veterans Project. 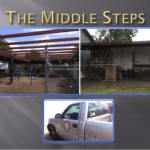 In 2012, we were able to cover the sales area via a grant from former County Commissioner Jerry Garza. 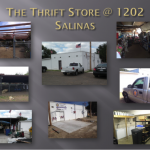 The Thrift Store donations and sales began to take off and the Laredo community began to notice VSTN. Support from all over Webb County, colleges and universities, high schools, community groups and businesses began to volunteer their time and resources. 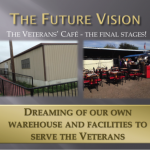 The Veterans Project vision was moving forward at an amazing pace. We now employ 4 full time staffers and our number of daily volunteers grows every month. VSTN is on social media and has grown due to PSA’s from our local news station, KGNS. Our program has grown from serving 37 clients in January of 2010 to 510 clients in March of 2015. Our clients currently receive 90 lbs of food (frozen and fresh) every month. VSTN also supplies our clients with toiletries and other household essentials on the third Saturday of each month (if available.) Our program started in 2010 serving only 10 lbs to each client– due to the generosity of our community, our food storage has grown leading us to the ability to provide a greater amount of food each month. We are currently utilizing donated vehicles for transporting our Veterans to their appointments and food pick-ups. However our current vehicles are not handicap accessible and do not fulfill the true needs of our clients. We are searching for a donation of handicap accessible vehicles so we can give our most underserved clients the assistance they require. The future of the Veterans Café has moved along as well due to a donation of a portable office unit (pictured below– pending a move to our location.) This will house the Café and food distribution area for those served by VSTN. The Café will be furnished with the used tables, chairs and benches donated by McDonalds and Walmart from their recent remodels. The Veterans will be able to socialize and relax in a welcoming, comfortable lounge-type area. The unit is handicap accessible and climate controlled. 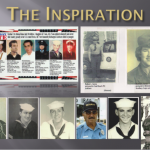 The success and future of the Veterans Project depends highly on support from the community. Please help us to spread the word. Feel free to swing by 1202 Salinas to see what we are all about.